The Background Tasks for Non Extracts view displays tasks that the server runs that are not related to refreshing extracts. For example, edited OAuth connections, subscription notifications, and so on. A table lists the tasks that ran in the time range specified. Click Success or Error to filter the table based on status. 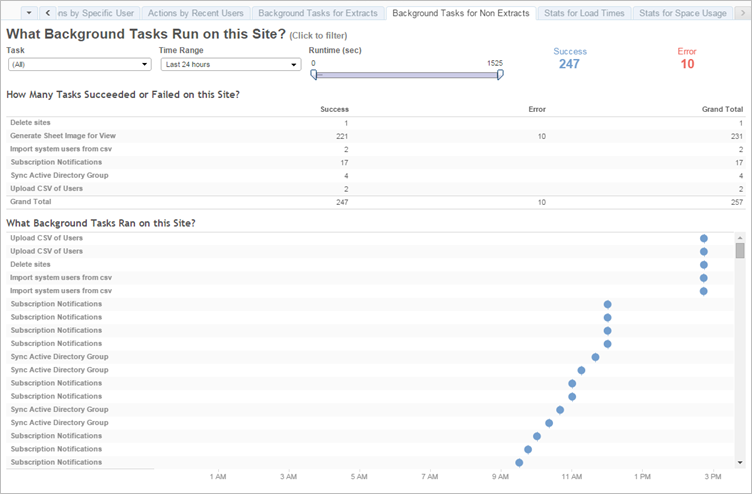 Select a specific task in the How Many Tasks Succeeded or Failed on this Site table to update the What Background Tasks Ran on this Site graph for the selected task. Tasks can have a status of success or error. For details about the task, use your mouse to hover over the success or error icon. Error—Server was unable to complete the task.